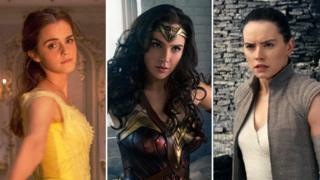 Female-led films may have topped last year's box office rankings, but the number of movies with women in the lead roles fell last year, a study has said. Last year's most popular films in the US were Star Wars: The Last Jedi, Beauty and the Beast and Wonder Woman. But the number of films with sole female protagonists fell from 29% in 2016 to 24% in 2017, The Center for the Study of Women in TV and Film found. The organisation based its research on the top 100 grossing US films. The report said: "Overall, audiences were almost twice as likely to see male characters as female characters." In the top 100 films, 58% had a male protagonist - defined as the character from whose perspective the story is told. That's more than double the 24% figure for women. The other 18% of films were classed as having ensembles. The study also found that 45% of protagonists were female in films with at least one woman director or writer. But films with exclusively male directors and writers ended up with females accounting for just 20% of protagonists. The study also found that female protagonists were "much more likely" to appear in independent features (65%) than big-budget studio features (35%). It was the other way around for men, though, with sole male protagonists more likely to appear in big-budget studio movies (54%) than in independent ones (46%). Female characters are still younger than their male counterparts. Male characters were most likely to be in their 30s (31%) and 40s (27%), while more female characters were in their 20s (32%) and 30s (25%). Women were given 34% of all speaking roles, a rise of two percentage points since 2016. They also accounted for 37% of major characters - the same as 2016. The researchers also found that, among all female characters with speaking roles, 30% were women of colour - up from 25% the previous year. Sixteen per cent were black, 7% were Latina and 7% were Asian. There were differences between men and women when it came to genre as well. Women were more likely to take a leading role in a comedy (30%) or drama (30%), followed by action (17%), horror (13%), animated features (4%) and science fiction(4%). Male protagonists were most likely to appear in action features (38%), followed by comedy (20%), animation (18%), drama (13%), horror (7%) and science fiction (4%).